I started out mapping out all the tools and doing a real diagram but that's like trying to understand how my brain works and I don't care that much about the details. 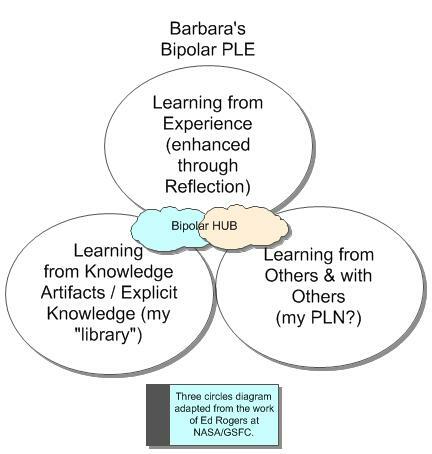 The point of the diagram above is that most of the annoyances I encounter with my PLE/PLN have to do with the bipolar nature of the beast. There's "WORK", which is quite interesting, but constrained by "this is a government computer" types of issues, and there are PERSONAL/PROFESSIONAL" interests beyond work. There are work-tools and personal tools. There are rules and confusing policies. 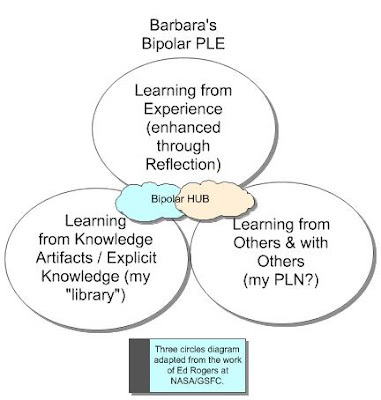 This is my PLE as I see it, though some of the tools listed on the WORK side of the brain made there way in the diagram only because they SHOULD be part of my PLE (if they were used effectively). I posted a second diagram with more details of the tools involved in the PLENK Flickr group.